The Sparks outlasted the Minnesota Lynx and Phoenix Mercury to win the First Division for 2017 in women's pro basketball. The women's basketball First Division came down to the final meeting between the Sparks and the Minnesota Lynx in 2017, but that meeting wasn't Game 5 of the WNBA Finals. It was the final regular season between the two teams, an Aug. 27 game at Staples Center. The Sparks were 9-5 going to their final First Division game, while the Lynx were 7-5 with remaining games against Indiana and Chicago. The New York Liberty already was in for the year at 9-6. Simply, the Sparks would clinch the First Division by winning the game, while the Lynx would clinch by winning this one and tacking up the next two gimmes against the two teams headed for relegation. The Sparks won, 78-67, a dominating performance in this signature rivalry of recent seasons. A 22-7 run at the end of the first quarter and a 13-2 run at the end of the second gave the Sparks a 46-32 lead at halftime. The Lynx never cut it to single digits. Of course, the Lynx and Sparks did later meet in the WNBA Finals, and the Lynx won that one for the league title. 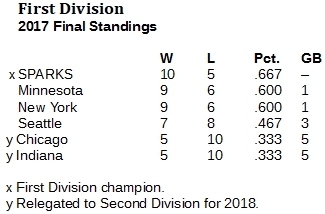 Chicago and Indiana are bound for the Second Division in 2018. 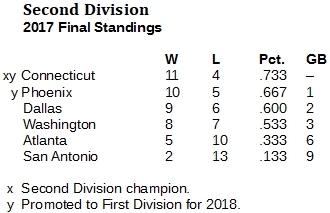 Connecticut and Phoenix were the winners in a tough four-team scrum for promotion to the First Division.